We first began discussing the idea of hosting an un-conference at our school for parents in the fall, at one of our monthly home & school meetings. Our principal, Joe Mazza, had attended something similar for educators called EdCamp, and hosted an EdCamp style staff meeting for the teachers. We all agreed that this style of learning could greatly benefit the parents not only in our school, but in our community. For me, I envisioned all of those parents who aren’t on Twitter, experiencing the learning and sharing like those of us who have connected on and participated in chats such as #PTchat…only this would be live, face-to-face two-way discussions. I’m not going to go into all the planning details in this post – but I will say the hardest part was explaining what ParentCamp was about, and how it could benefit those attending. For educators, many have heard of, or attended this style of conference – but for parents this was a foreign concept. Because this was so new to parents, we decided that it was best to line up session leaders in advance. (At actual EdCamps attendees write in sessions that they wish to lead once they arrive at the “unconference”) It wasn’t until we shared the session descriptions, that we really began to see people registering. As far as educators participating in this, it didn’t cross my mind before the event that some (or maybe many) would be uncomfortable with this style conversation – especially face-to-face with parents. We did have far fewer educators than parents attend, but the ones that attended added great balance to the conversations they participated in and were excellent leaders of discussions and not just lecturing. At our school, we see some of our most diverse and largest turnouts at educational focused events. This was no different and no less awesome and amazing to see so many people from all different cultures, communities, beliefs and lenses sharing their thoughts and asking questions, all while not judging the other’s because of their opinions. Not only did parents attend together, but we also had a few Principals attend with their parent association leaders (the ultimate sign of wanting a home-school partnership). To start the day off, we had Melissa Bilash as our keynote speaker. She shared snapshots of what role parents, from all around the world, play in their child’s education. This would have been a great presentation no matter where it was shared, but with such diversity in the room, I feel it was a homerun. In the sessions I attended, I witnessed parents from different schools learning together about the potential of parents connecting through social media to how to plan for the big expense of sending their children to college. I caught a few minutes of parents and our district admin learning about iPad apps together; a custodian sharing one of the most powerful first-hand experiences with losing a child to drug use and ways we can hopefully prevent that same tragedy in our own homes or community. There was another session with teachers learning with parents about better ways we all can support our children’s emotional well being together inside and out of school (this was one of several sessions that had pro-active parents of children not starting school until this coming September). In the session I led with a few other members of our home & school board, we started out with sharing the ways live streaming our monthly meetings has improved participation, communication and relationships in our school and finished up with the importance of, and ways to successfully lead positive, productive and constructive meetings. These views, ideas and suggestions came from a room of parents, other PTA/HSA leaders, teachers and principals from our district and a few others. I was only a portion of the conversation, everyone contributed their thoughts and experiences, and we all took away pieces that we felt would improve our own schools. I love participating in chats on Twitter. It really is something else (and almost addicting) to be able to learn about how other people view and approach the same task as you from other parts of the country or world. BUT….I also think it’s as equally as powerful in building up a community when you have a physical room of people together sharing thoughts on how to help each other with an issue, learn a new way of communicating, or improve on current efforts. I hope after leaving #ParentCamp, if they didn’t already, people saw the benefits of ongoing communication between one another, at all levels. That speaking with each other a few times a year is not enough. That, conversations need to be on a deeper level, where schools and families come away with new knowledge. These conversations can and should be had, as often as possible in our communities. They don’t need to be big, grand events, nor do they need to be limited to face-to-face. The more often we all speak AND listen to each other, the better we can make decisions on what’s best for our family, schools and community. I can’t wait for the next #ParentCamp. It is energizing and exciting to families and schools learning and working together to build stronger partnerships. After being invited to lead a session at Knapp’s first Parentcamp, my reaction was – of course! It was after that immediate YES that I thought, what can I talk about? Joe and Gwen decided a good topic would be “The Blue Ribbon Experience”. While I was first uncomfortable with the topic (only because it could come across as arrogant or elitist), I realized it was a great way to highlight and discuss all the wonderful things happening at Cantiague. So, while the focus would be on the award process, the meat of the discussion would be the characteristics and evidence of excellence taking place at my school. It would also be an opportunity to hear how other schools were approaching the same tasks. At Cantiague, there is always an interest in improving, never settling for status quo. A few weeks after confirming attendance, we found out that Tony Sinanis, my principal at Cantiague, would be joining us. What a wonderful opportunity for parents and educators to have the perspective of both home and school in one discussion. This was going to be a great session. The discussion was very informal and fluid. It was constant stream of questions and answers, with not a second of empty space. We began with a description of what the Blue Ribbon award is, and moved onto the award process our team embarked on. The most enjoyable part of our session was when we spoke about our teachers and staff, the programs used at Cantiague, and the fostering of literacy as a core of what we do. I felt that we were able to present a window into our school – highlighting the relationships between families, teachers, staff, administrators, and students. I learned from our session as well. There was a principal and incoming H&S president in our discussion. Seeing that team work and dedication was inspiring. A dedicated 5th grade teacher from NJ joined us as well. While many questions did become professionally directed, we were all at the table. This was a wonderful chance as a parent to hear the discussions that often take place in a staff meeting between professionals. The conversation was authentic and real. Everyone was genuinely invested in creating the best learning experience for their students, and it was beautiful to see. In the end, I hope that attendees were able to take away a few concepts – passion is the foundation for making a truly special school and experience for students, anything is possible – relationships can always be built and fostered, and transparency and educational opportunities that promote constant learning for all parties creates an opportunity for wonderful, creative, holistic learning. 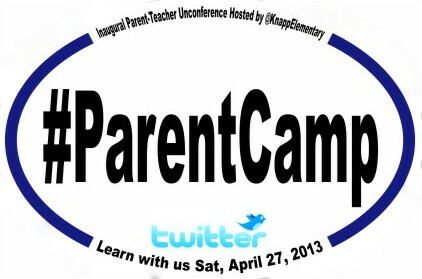 As an attendee, I really enjoyed the ParentCamp experience. I participated in a Parent Engagement discussion led by Dr. Mazza and Tony Sinanis, and the presentation on live streaming Meetings by the Knapp H&S. I loved the format of the ParentCamp. It was very informal, with discussion continuously shifting and changing to address the questions and comments of the participants. In the first session, the presenters began with the description of a Partnership School from Beyond the Bake Sale. Conversation quickly customized to the parents and educators in the group. Each person shared questions, experiences, and thoughts. It was a very rich experience, with many takeaways to think about. The next session was about the benefits of live streaming H&S meetings, and bringing meetings and information to all families. The H&S shared their experiences of taking their meetings to the community. It was enlightening and inspiring to hear the benefits of meeting parents in their comfort zones, and how the experience built trust in the school. The live streaming opportunities also bring information to parents who once were unable to participate. We also discussed the importance of keeping meetings timely, respectful, and meaningful for all involved. We were fortunate to have many H&S leaders in the group. Each shared their most positive events and strategies to engage families and bring them into the fold. Overall, I left ParentCamp feeling more strongly than ever, the importance of empowering families to engage in home/school experiences. I left with abstract and tangible ideas on how to create positive relationships with all home/school players – students, parents, teachers, staff, and administrators. Learning with like-minded parents and educators fueled my desire to always improve our efforts as leaders in the parent community. I can’t wait to try some of the ideas at my school!